Born in Moscow he lives in the United States since 1976. His early carrier as an architect profoundly influenced his work as an artist. 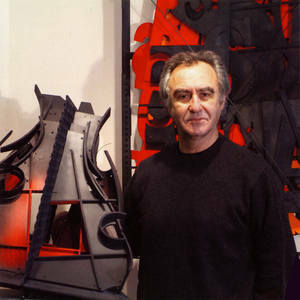 His materials are: welded steel, architectural plastic and paint. Unlike many of my fellow sculptors he never uses found things in his work. His works on paper are closely related to his sculptures and fall into two categories: ink paintings on paper and acrylic and ink on drafting film. Most of the time I prefer to work in a series format. Collections vary from 2 to 15 pieces. ARTIST STATEMENT: I think that absolute freedom in art is no more than a mirage. Like a vanishing point, not only it is not achievable, but also constant strive for being totally uninhibited fundamentally contradicts the very nature of art. I discovered that by trying to free myself I instead only created un-freedom within, but at the same time I recognized it as a blessing because this un-freedom, to my great surprise, flowered into my very own freedom. I built my personal space inside it, I fenced in all I was made of and then I gladly confined myself into this space and opened all the windows to share what’s inside with others. This is the moment of great joy for me because this space has never existed before I have created it. Not unlike theater, my work attempts to counterpart outside reality with no ambition to compete with it. It is just a window into my parallel world, my very own, not so little Universe.